Properties in Brazil average 4.7 out of 5 stars. 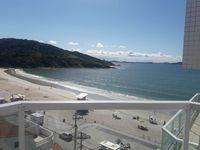 Property 4: Rent Wonderful Apartment at 120 meters from the Great Beach of Ubatuba !!!!! The sea border on Jatiúca Cond. JTR. Apt. Suite / room / kitchen accommodates four people. Property 7: The sea border on Jatiúca Cond. JTR. Apt. Suite / room / kitchen accommodates four people. Property 24: Juquehy beach house with pool, sleeps 6 adults and 2 children, cond. closed.